This book is one of the best examples of a valuable new insight. Tracy has studied Nelson’s career examining not just Trafalgar, but the equally significant battles of St Vincent, the Nile and Copenhagen. 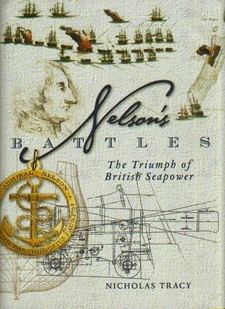 Every year new books are published on the subject of Admiral Lord Nelson and the Royal Navy of his period. It seems an almost inexhaustible topic area and yet so well populated that there cannot be room for yet another book. However most new books bring fresh insights and perspectives on what continues to be an extremely popular subject. This book is one of the best examples of a valuable new insight. Tracy has studied Nelson’s career examining not just Trafalgar, but the equally significant battles of St Vincent, the Nile and Copenhagen. Trafalgar has been covered not only for the event itself, but also for the aftermath and its impact on future naval history. This is a book that no serious student of the subject and the historical period will want to be without. The readable text is supported by black and white illustrations throughout the body of the text. The book will be read by a very wide readership because it is competitively priced, well produced and an engaging account of the career of Britain’s most famous naval legend.